There’s so many healthy benefits for including kale in your diet. Did you know kale contains more iron than beef, more calcium than milk and 10x more Vitamin C than spinach? Not to mention it’s good for your eyes, skin, bones, lowers cholesterol, helps with weight loss, reduces the risk of heart disease, and cancer! No wonder it is called a SUPER FOOD! This delicious and healthy kale chopped salad recipe is a great way to throw some super food veggies together and enjoy a satisfying crunchy salad. This has become one of my go-to salads to make as a large batch and enjoy my with dinner for a couple meals. Depending on your preferred toppings or dressings, this salad can be served like a sweet coleslaw or as a savory salad. As a little tip – if you have any family members that are not fond of Brussels sprouts, this is a great way to sneak them in! What is a chopped salad? It is a salad where all the ingredients have been chopped to a fairly uniform size. Yes, chopping the salad ingredients does take a little more work, but it is definitely worth it as the chopping allows the flavors to mingle. For some great Low Fat Recipes, Low Calorie Recipes, Low Carbohydrate recipes, and Diabetic Recipes, check out my Diet Recipe Index. Also check out my Nutritional Chart for fat grams, fiber grams, and calories for all your favorite foods. It is very hard to give you the exact amount of each ingredient because this is one of those recipes that you just make and use the salad ingredients that you have on hand. Be creative - your family will love it! * Kale leaves: Wash, dry, and cut out the tough center ribs and stems. Chop or tear all the prepared kale leaves into bite-sized pieces and put them in a medium-sized mixing bowl. The center rib is edible, though fairly fibrous. The leaves can be eaten raw, sauteed until wilted, simmered with a soup, or even roasted until crisp (you can also freeze and save the stems to use in stir-fries, sauces, or soups). Wash and dry all the vegetables. Remove all moisture from Kale and vegetables before chopping, otherwise they will get soggy (this is because as you chop, you release more moisture). Pat dry with paper towels. Try to chop the vegetables (except the onion) as uniform as possible. You can chop ingredients ahead of time (I do this all the time), but store them separately in the refrigerator until you are ready to serve the salad. 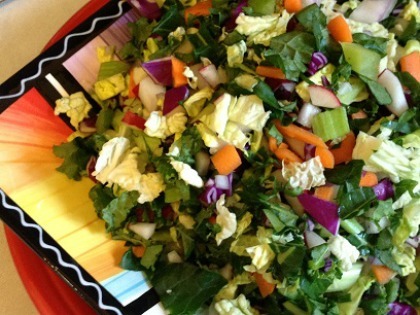 In a large salad bowl, mix together the chopped kale, Brussels sprouts, red cabbage, Napa cabbage, red onion, radishes, carrots, celery, red bell pepper, and cucumber. If holding for a long period of time, store in the refrigerator. Otherwise, cover and let set at room temperature until ready to serve. When ready to serve, toss with a salad dressing of your choice. See Salad Dressing Ideas below. In a blender or food processor, combine raspberry vinegar, raspberries, honey, and basil leaves; whirl 1 minutes or until well blended. With the motor on, add olive oil in a slow steady stream, whirling until dressing is smooth. By gradually whisking or blending the oil into the vinegar, you create an emulsion (a mixture of two liquids that usually do not combine smoothly). For a creamy savory salad, use my low-fat ranch dressing recipe and top with chopped black olives or avocado to add a healthy fat and sprinkle with grated parmesan cheese. In a small bowl, mix together the yogurt and ranch seasoning. Add 1 tablespoon of milk at a time until you have reached the desired consistency. Store, covered, in the refrigerator. Serve cold. Dressing can keep in refrigerator for up to 3 to 4 days.